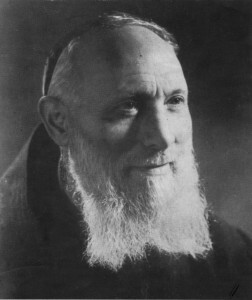 Lina Fiorellini met Padre Pio in 1919. At that time, Lina was employed by the Pontremoli family. Lina thought very highly of the family and felt blessed that she could work for them. She spoke to Padre Pio and asked him to always keep the Pontremoli family in his prayers. “They are good people,” Padre Pio replied. “I will remember them before the Lord and pray to Jesus for their salvation.” Lina often shared her Catholic faith with Lucia Pontremoli and her son, Aldo. Although they were not Christians, they listened to Lina with great interest and respect. Lina also told them many stories about Padre Pio. Aldo, who was a professor at the University of Milan, was preparing to go on an expedition to the North Pole. The whole world was following the upcoming expedition with great anticipation. It was scheduled for the spring of 1928. Shortly before Aldo and the crew left for the North Pole, they were granted an audience with Pope Pius XI. Aldo was so inspired by meeting the Pope that he sought out a Catholic priest and asked for baptism. Several days later, he left on the expedition. Tragically, Aldo lost his life, as did the other crew members, when the airship they were traveling in collided into ice. Lina continued to pray for Aldo’s mother, Lucia Pontremoli. Padre Pio encouraged Lina to offer up all of her sufferings for the conversion of souls, including Lucia’s. On Holy Thursday 1946, Lucia asked for baptism. Padre Pio was filled with joy when Lina told him the good news. Lina and Padre Pio had both been praying for Lucia for more than twenty-five years. There was a woman (name withheld) who was married to a very successful businessman. Soon after their marriage, her husband became cold and indifferent. When he got home from work in the evenings, he hardly spoke to her. Whenever he could find the chance to get away, he would leave the house and not return until very late in the evening. Feeling neglected and alone, the woman became very depressed. She prayed for a solution to the problem. The woman possessed a holy card of Padre Pio. On one particular day, feeling the painful reality of her situation, she took the holy card in her hand and prayed, “Padre Pio, I am very sad about the state of my marriage. Please wake my husband up and help him to change. Come to him in a dream or do whatever is necessary, in order to shake him out of his indifference toward me. Show him the error of his ways. 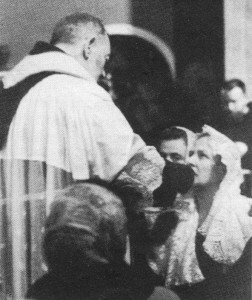 Please save our marriage!” Even though the woman knew practically nothing about Padre Pio, she was glad that she had prayed to him and asked for his help. That evening her husband returned home very late as usual and during the night he had a strange dream. In his dream, he was in a beautiful building. It looked like a brand-new hospital and it had a lovely marble staircase. As he walked down the staircase, he saw five monks who were coming up the staircase toward him. Each one was wearing a brown habit. Following behind them was a sixth monk. The five monks walked past him but the sixth one stopped in front of him. The monk looked at him sternly and then raised his hand in a warning gesture. At once, the man thought of his wife and how badly he had been treating her. He recognized the monk who had looked at him in such a severe manner. It was Padre Pio. The man felt shaken by the dream. He suddenly felt remorseful for his conduct toward his wife. The dream had seemed so real that it woke him up out of a sound sleep. He could hardly wait to tell his wife about it. The next morning, the man knelt down at his wife’s bedside. He gently touched her hair in a caress in order to waken her. He spoke to her with great tenderness and asked for forgiveness for his coldness and for his neglect. She could hardly believe it. He had not spoken to her with such affection since they were first married. Moreover, she had never known her husband to apologize for anything. To see him kneeling at her bedside was perhaps the greatest surprise of all. Because of his pride, he was definitely not the kind of man to get down on his knees for any reason whatsoever. Later, the woman made a trip to San Giovanni Rotondo and was able to visit the Home for the Relief of Suffering. The hospital was beautiful in every way. She noticed the wide and attractive marble staircase near the entrance. She remembered her husband had told her that in his dream, he had been in a beautiful hospital that had a marble staircase. Because of the dream of Padre Pio, her husband made a great effort to change. Their marriage was blessed with happiness from that time forward. Antonio Ciannamea traveled to San Giovanni Rotondo to see Padre Pio on many occasions. He always felt it a privilege when he could visit Padre Pio in his cell. On one occasion, Antonio had an unusual dream. In his dream, Padre Pio was sitting in his customary chair in his cell and Antonio was kneeing beside him. Through Antonio’s parted lips, Padre Pio placed a tube and breathed into it three times. Padre Pio’s cheeks swelled as he blew the air into the tube. When Antonio felt Padre Pio’s breath, he experienced a great sense of well-being. Padre Pio then said to him, “Go with God’s grace.” With that, Antonio woke up. For the most part, Antonio did not believe in the symbolism of dreams. But because the dream of Padre Pio had seemed so real, Antonio felt that it held a message. Exactly what that message was, he did not know. When he told his wife about the dream, she became worried. She told him to be careful when he was at work because to her, the dream seemed to be a kind of warning. That day, Antonio visited a number of the different departments in the factory where he worked. About six tons of molten lead were about to be turned into the framework for the batteries of electricity accumulators. Some of the employees were busy cleaning extra filaments from the frameworks. At the same time, the conveyer belt was bringing lead bars forward for collection and loading. The head factory technician had a piece of tube that he was placing into the lead. Suddenly, a shower of boiling lead flashed through the air. It reminded Antonio of a burst of violent machine gun fire. The solidified lead landed on Antonio’s hair, clothing and shoes. Antonio was filled with terror, but to his great relief not a drop had touched his skin. He was unhurt. The employees who were nearby and had witnessed the near fatal accident, told Antonio how lucky he was to have escaped injury. There was a man from Italy (name withheld) who was brought up in a good Catholic family, but when he grew older he left his faith far behind him. When asked what he believed in, he said simply, “nothing.” He became a self-declared atheist. The man married and had a family but secretly he was living a double life. He was unfaithful to his wife and had no desire to change. One night, when the man was at a hotel with his girlfriend, he surprised himself and those around him by suddenly stating that he was leaving. He told his friends that he was going to drive to San Giovanni Rotondo to visit Padre Pio. All of the people who were with him thought that he was joking. Everyone knew that he was not the kind of person who would be interested in visiting a priest. The odd thing was, the man knew almost nothing about Padre Pio. Perhaps he had heard a few facts about Padre Pio’s life somewhere along the way, but there was nothing concrete that he could remember. Why he would suddenly have the overpowering urge to visit Padre Pio was a complete mystery. It was about 2:30 a.m. when the man left the hotel. As he walked through the lobby toward the exit door, the hotel doorman asked him where he was going at such an hour. “I am driving to San Giovanni Rotondo to see Padre Pio,” the man exclaimed. The doorman was well aware of the worldly life that the man led. “But why would you want to go to a monastery in the middle of the night? What is the attraction?” the doorman asked. The man could offer no explanation. He did not understand it himself. The man arrived at the monastery of Our Lady of Grace before sunrise and waited patiently in the darkness for the church to open. When Padre Pio began his Mass, the man became completely absorbed in it. All through the Mass, he experienced a wonderful feeling, something that he could not explain because he had never experienced it before. After the Mass, one of the Capuchins came up to him and asked him if he wanted to go to confession to Padre Pio. The thought had not even entered his mind, but since the Capuchin had suggested it to him, he decided that it was a good idea. In the confessional, Padre Pio said to him, “It has been a long time since your last confession, hasn’t it. How long has it been?” “It has been fourteen or fifteen years,” the man replied. “Oh no, it has been a lot longer than that!” Padre Pio said. “What you want from me, I cannot give you. You must go to another who will give it to you.” The man had no idea what Padre Pio was talking about. The man left without making his confession. He had not even received a blessing from Padre Pio and yet, he felt very happy and very satisfied. He was grateful that he had been able to speak to Padre Pio for those few moments in the confessional and attending the Mass had been a beautiful experience, more than he ever imagined. He left San Giovanni Rotondo greatly uplifted and knew that he wanted to return again. Shortly after that, the man had a dream. In his dream, he saw Padre Pio walking down a staircase toward him. He was accompanied by another person who was dressed in white. Padre Pio took a folded paper from the pocket of his habit and handed it to the man. The words, “St. Alphonsus Liguori” were written on the paper. Then the man woke up. The man frequently thought about the dream and wondered about its meaning. A short time later, a nun who lived in the same town as the man, asked him for a favor. She needed a ride to Foggia and wondered if he might be able to take her there. He was happy to assist her. On the way to Foggia, he told her about his dream and asked her what she thought it meant. “Perhaps it means that Padre Pio would like you to carry a picture of St. Alphonsus Liguori with you,” the nun said. Not long after, the nun brought him a picture of St. Alphonsus Liguori. The man was astonished to find that the picture was inside of a folded paper that was identical to the size and shape of the paper that Padre Pio had given to him in his dream. He carried the little picture with him at all times. The nun told the man that St. Alphonsus had lived in the town of Pagani at the Redemptorist House. Many of his relics were still preserved and venerated there. She thought it would be meaningful for the man to visit the Redemptorist House and encouraged him to do so. He decided to follow the nun’s advice and shortly after that he made a trip to Pagani. The man knelt down and made a sincere confession. Unashamedly, he cried throughout the lengthy confession. The priest was so moved by the man’s confession that he cried along with him. After the confession, the priest took him to the chapel where he gave him Holy Communion. The man realized that Padre Pio had been leading him back to God, one step at a time. On his first visit to the monastery of Our Lady of Grace, he had been totally unprepared to approach the sacraments. But now, he was a completely changed person. He had a great desire to see Padre Pio again. When the man returned to the monastery of Our Lady of Grace, Padre Pio greeted him with love and called him his son. They were words to treasure. He made his confession to Padre Pio and received absolution. He returned on many more occasions to the monastery of Our Lady of Grace. Father Placido of San Marco in Lamis and Padre Pio were fellow students and close companions in the Capuchin novitiate and their friendship became even deeper with the passage of time. Padre Pio was like a brother to Father Placido. After Padre Pio’s death on September 23, 1968, Father Placido wondered if perhaps his own time on earth might be drawing to a close. He spoke about it to Father Alberto D’Apolito. Father Alberto assured Father Placido that he was indeed healthy and would surely live for many more years. But Father Placido could not be convinced. Not long after that, Father Placido told Father Alberto that he had a dream of Padre Pio. In the dream,Padre Pio said, “Father Placido, you must prepare yourself. You will be joining me very soon.” “Will I be joining you in a few more years?” Father Placido asked. “No,” Padre Pio replied. “You will be joining me in just a little while. You will not see the end of this year.” Father Placido died on December 25, 1968. He did not see the end of the year. There was once a woman (name withheld) who, due to deeply-rooted psychological problems, had not been out of her house for twenty-five years. In all of those years, she had not seen her brother. Finally, her brother contacted one of the relatives and found his sister’s address. It was then that he learned the particulars of her problems. One night the woman had a dream about a saintly looking priest who smiled at her. Also, one afternoon she noticed the fragrance of roses in her home. One day, the homebound woman summoned up the necessary courage and was able to leave the house and go to Mass. Afterward, she found a magazine about Padre Pio and purchased it. She recognized him as the priest she had seen in her dream. Finally, her dear brother visited her. He told her that he had been praying to Padre Pio so that she would regain her confidence. Tom Dunne had a motorcycle accident and his left hand was damaged as a result. From that time forward, he always had pain in his hand. Tom began to pray the novena to Padre Pio every day. One night before Tom went to bed, he was reading a book on Padre Pio. The book told a story of a woman who asked Padre Pio if she could suffer some of the pain that he was suffering. Padre Pio said to her, “If you had even a part of the pain that I have, you would die.” Tom then said a prayer to Padre Pio with all the sincerity of his heart. 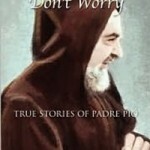 “Padre Pio,” Tom prayed, “I have chronic pain in my hand. My hands are important to me, but nevertheless, I would never ask you to suffer my pain.” At that time, Tom had been enduring the pain in his hand for ten years. Not long after, Tom had a dream in which he saw Jesus and Padre Pio smiling at him. When he woke up, the pain in his left hand was gone, never to return. There was a woman (name withheld) whose financial problems became so serious that bankruptcy seemed inevitable. She had worked diligently to make a success of the family business but no matter what she did, it failed to turn a profit. Her brother Louis ran the ice cream manufacturing side of the business. He put in very long hours and was accustomed to working seven days a week. When Louis passed away, some of the other family members took over his part of the work. Unfortunately, the business went from bad to worse. Finally, the woman decided to sell it and pay off the bank loan and the debts that had accumulated. It was the only way she could avoid bankruptcy. About that time, the woman had a beautiful dream. In her dream, she saw Padre Pio who looked very happy. Padre Pio and her brother Louis were together. “Everything is all right now,” Padre Pio said to her in the dream. From that day forward, the business prospered. There was a steady increase in customers to the extent that the woman had to buy more equipment and additional refrigerators. More employees had to be hired as well. Truly, Padre Pio had been watching over his spiritual children. Lilia Glorioso was the leader of a prayer group in Castelbuono, Italy. In 1972, she and her husband were preparing to celebrate their twenty-fifth wedding anniversary. They were happy that all five of their children could be present for the joyful occasion. The anniversary celebration turned out to be a wonderful success. One of their daughters, Marianna, was returning to her home in Palermo right after the celebration. Marianna’s fiancé and two other friends were traveling with her. On the trip home, Marianna’s fiancé fell asleep at the wheel and their car crashed into a wall. Tragically, Marianna died in the accident. The other three passengers were not hurt. Concetta De Garbo was a friend and a neighbor of Lilia Glorioso. On the very night that Marianna died, Concetta had a dream. She dreamed that she was walking on the main street of Castelbuono when a car stopped in front of her. The driver spoke to Concetta and told her that Padre Pio was inside the car. Padre Pio then spoke to Concetta and asked her where she was going. She told him that she was going to visit her sister who was very ill. “I will go with you,” Padre Pio said to Concetta and he invited her to get in the car. In Concetta’s dream, she and Padre Pio soon arrived at her sister’s house. Padre Pio prayed for Concetta’s sister and blessed her by placing his wounded hand on her. He then went over to the window which looked out onto the house of the Glorioso family. “Be sure to tell her to hurry because I will not be able to wait for her!” Padre Pio said to Concetta. She did not understand what he was talking about. In her dream, Concetta then went over to the window and stood next to Padre Pio. As she looked out the window, she saw a woman across the street who seemed to be in great distress. She was dressed in black and her eyes were red from crying. “Oh, it is Lilia, the mother,” Padre Pio said. “I feel so sorry for her. She is suffering so much!” With that, Concetta woke up. Upon waking, Concetta heard loud voices as well as crying that seemed to be coming from the street. She went to the window and discovered that the noise was coming from the home of the Glorioso family. She got dressed and hurried over to their house. She then learned that Marianna had passed away. That same day, Concetta visited her sister who had been gravely ill. She was surprised to see that her sister looked well. Her sister told her that all of her pain was gone and that she had never slept so well or so peacefully as she had on the previous night. Concetta remembered that in her dream, Padre Pio had prayed for her sister and had blessed her. Her sister made steady progress and was soon able to go back to work. When Concetta took her for a medical examination, the doctor gave her a clean bill of health. My mother Angela had always been very devoted to Padre Pio and also to the Madonna Paradiso (the Madonna of Paradise) the patroness of the town where she grew up in Sicily. When my brother Joseph was diagnosed with cancer, my mother prayed constantly to Padre Pio and to the Madonna, asking for a miracle. But a cure was not to be. My brother died in 2009 after suffering for one and a half years. My mother became so distraught and so heartbroken at my brother’s death that she told the family she no longer believed in God or in the power of the saints. She said that she was going to take all the statues, sacred paintings, and religious articles out of her house and that she would never pray again. She was finished with religion forever. The experience was so vivid that it woke my mother up from a sound sleep. She began to wonder, “Was it a dream or did Padre Pio actually pay me a visit?” She finally got back to sleep only to have the very same dream, exact in all the details. She again awakened and this time she stayed up for the rest of the night. The dream brought closure and peace to my mother. She never again spoke against the Church. She took up her practice of prayer and her devotions, just as she had in the past and remained faithful until her death. St. Paul teaches that this life of ours is like traveling abroad from our home country. He says, “As long as we are in the body, we are traveling away from the Lord (Corinthians 2: 5-6).” Since we are still traveling in a foreign land, we ought to keep in mind what our home country is – that country to which we must hasten by turning our backs on the attractions and delights of this life. This homeland toward which we travel is the only place where we can find true rest because God does not wish us to find rest anywhere else. The reason is simple: if God gave us perfect rest while we were still abroad, we would find no pleasure in returning home. 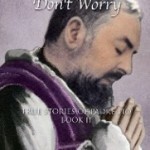 Pray, Hope and Don’t Worry: True Stories of Padre Pio Book 1 written by Diane Allen and published by Padre Pio Press is available at amazon.com.